Am I posting too many dessert recipes these days? Do you think so? I didn't forget my resolution I took beginning of this year to post more savory items. But you know things happen. Not to mention that the busy schedules on summer makes it nearly impossible to cook an elaborate dish and spend time for the photo shoot. But I assure that I will be posting an interesting savory dish next time :). Recipes with lesser number of ingredients and minimal steps always draw attention. A longer list of ingredients may deter some readers even though the steps may not be intricate. So here is a simple yet delicious recipe that uses only 4 ingredients and can be prepared with 3 simple steps. 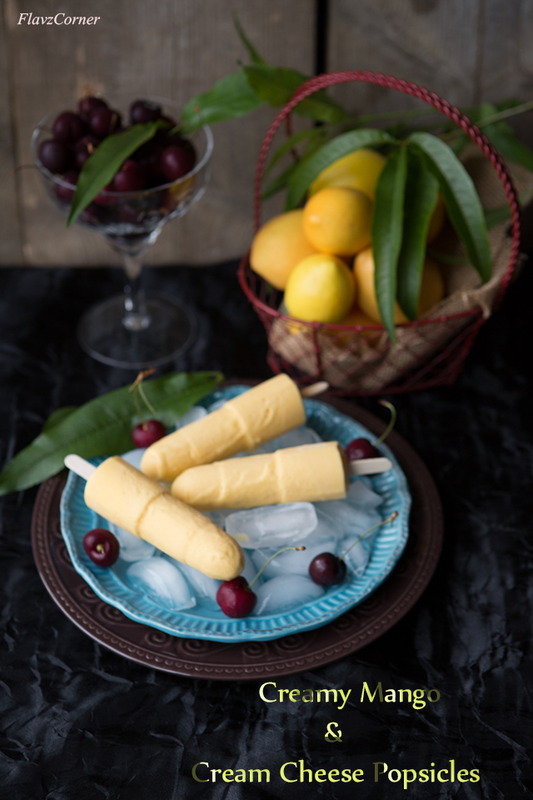 Go ahead and try this summer treat while the Mango season lasts. If you are a Mango fan, you are going to love it!!! 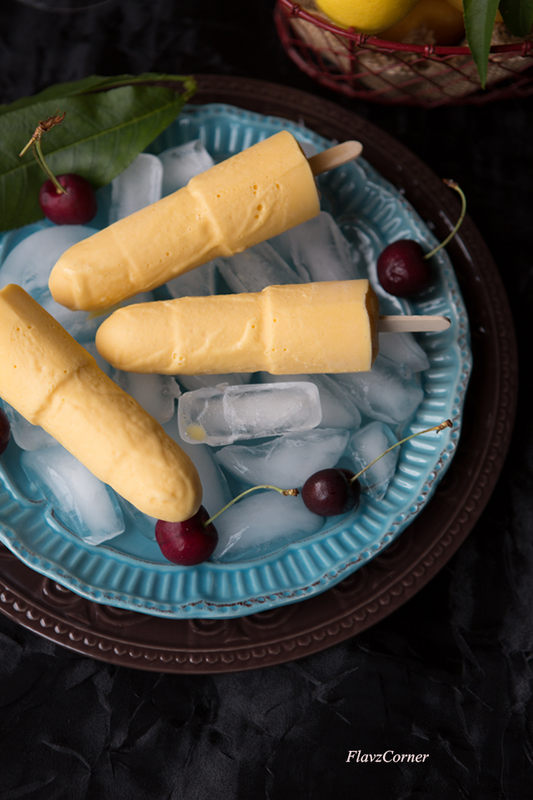 Enjoy the creamy Mango Popsicles on a Sunny day!! These are a perfect summer icy treat! Mango and cream cheese together, that sounds awesome! Love ur pics Shibi. What a beautiful recipe! 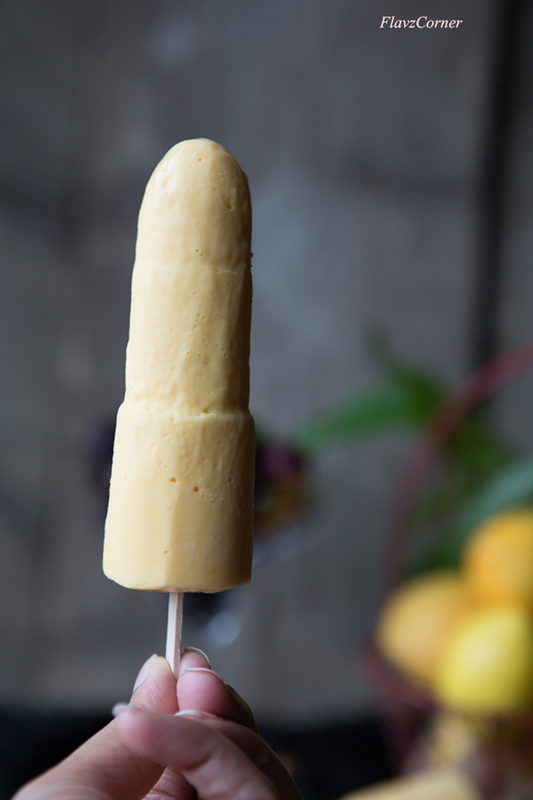 I would have never thought of using cream cheese in popsicles!!! SO smart... it must make them super creamy! wow..what a great combo of cream cheese and mangoes,looks a perfect summer treat...yummmmyyyy!!! Love the sound of mango and cream cheese. The popsicles have a lovely, cheerful color and look so inviting. Kind of thing to have on a sunny beach! Wow, these sound so incredible! Yum, yum!!! One can never post too many dessert recipes. ;-) I love mango, so you know I'll love this recipe. Really terrific -- thanks.